Last year I had the privilege of seeing, first-hand, the amazing work Oasis is doing in Mumbai. One of the projects we were particularly struck by was an orphanage in the district of Thane. We spent a day visiting the home and Tim led a drama workshop for the eight boys that live there. These orphans were found on the streets of Mumbai and placed into the care of Oasis. Some have a terminal condition, others have disabilities. You don't see this when you meet them though. They are bubbly, enthusiastic and keen to share. They go to school, play sport and have the same dreams and aspirations as most 6-13 year boys. Oasis has provided them with a secure, stable, family environment. They are cared for by two house parents, who also have toddler themselves. It's hard to verbalise what a difference this home makes to them. If you have children yourselves, then picture them loosing you at the age of 2-3, and them having to grow up on the streets. This is a daily occurrence in Mumbai, but through the work of Oasis, these eight boys have been given the chance of a future and some hope. 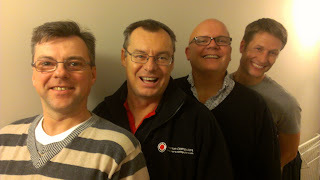 As part of our response to our visit, we're taking part in Mo-vember. Graham, Dave, Tim and I will be remaining unshaven for the month of November to raise funds to help Oasis continue its great work at the orphanage. I'll be posting facial hair updates through out the month. Please give generously via our just-giving page. Spare a thought also for our lovely wives who normally object to such manly growth!